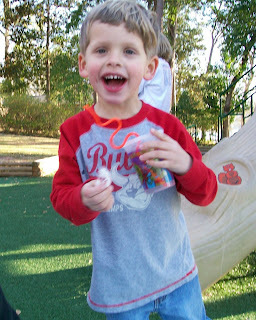 A random cute picture of Dawson, smiling and having fun at the park one day. 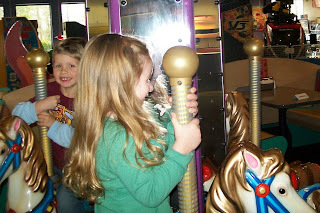 We had another play date at Pump It Up this month. 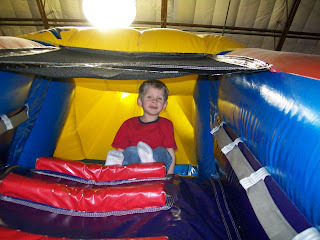 It is one of our favorite places and Dawson always has a great time jumping around, going through the obstacles courses, and down the huge inflatable slides. 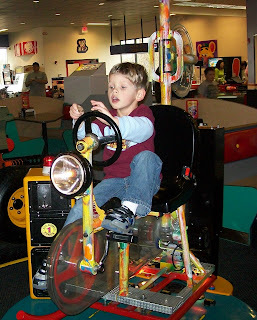 What a fantastic kid's place! Dawson at the top of the ladder, waiting for me to climb up and go down the slide with him. 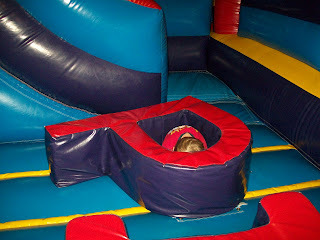 Crashed at the bottom of a slide. Hiding inside the giant "P."
Popping out of the "P."
Brady is 5 months old today. It's amazing how much he's grown and accomplished in such a short time. He can roll across the room, scoot across the room by pushing with his feet, and is now pushing up on the palms of his hands when he's on his stomach. 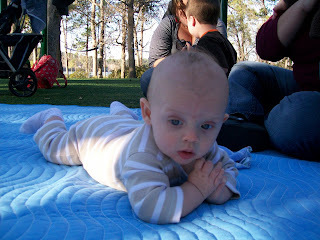 His preferred position is on his stomach where he can lift up on his hands and look around at everything. He also enjoys standing and sitting up, with a little support from one of us. He is a very active little baby and doesn't like to be still for very long. Another new development is the addition of his bottom 2 front teeth. 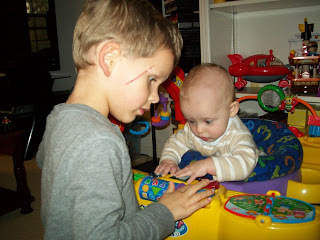 They've both broken through and are very sharp! It also looks like more bottom teeth are soon to come. 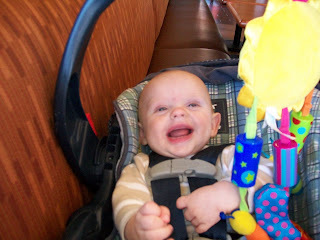 Brady's personality is also more evident now that he's 5 months. He has such a sweet nature, is VERY tolerant of his big brother, goes with the flow very well, and loves to smile and laugh. He is amazing and wonderful and fills our days with joy. Now if we can just get him to sleep better at night . . . . 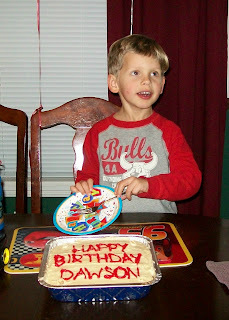 This year, Dawson had a friend party for his 4th birthday. 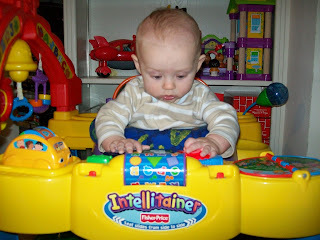 He chose a Spiderman theme as he's very interested in all things superhero these days. We reserved our neighborhood community room in order to accommodate all of his friends and because January is often too cold to have a birthday party at the park. 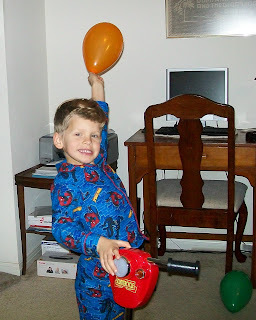 We decorated the room with Spiderman ballons and decorations, brought a few toys and a small inflatable jumper from home, planned a craft and a few Spiderman-themed party games. The kids had fun creating their own superhero masks, playing the spider toss game, playing spider splat with gooey spiders, doing a web walk (instead of cake walk), a pinata, and "webbing" pictures of villains with silly string. 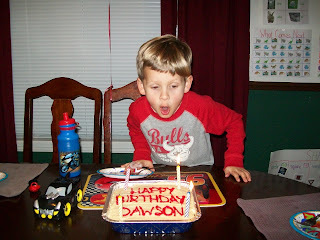 Dawson was thrilled to celebrate his birthday with all of his good friends and continues to talk about what a great time he had at the party. 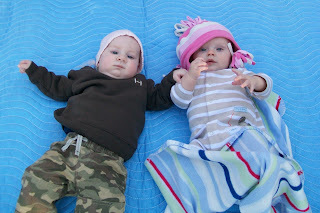 I am extremely blessed with great friends who also have great kids close in age to my kids. 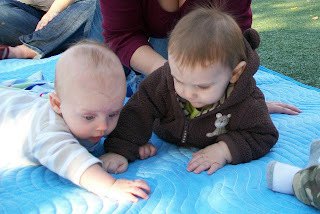 The other day at the park, the big kids were playing on the playground and all the babies were gathered on the blanket. It was so precious! 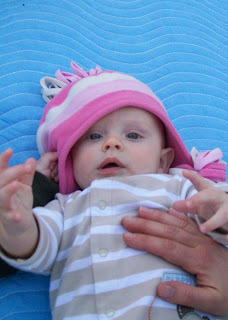 Kaelin was kind enough to let Brady borrow her cute pink hat to keep his head and ears warm. He looks so cute in this frilly, girly hat! 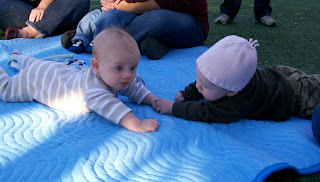 Brady with his best buddy, Wesley (they are only 5 days apart). 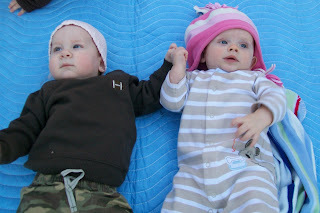 Brady and Wesley on their stomachs - still holding hands!! Baby Carter coming over to check out the younger babies. 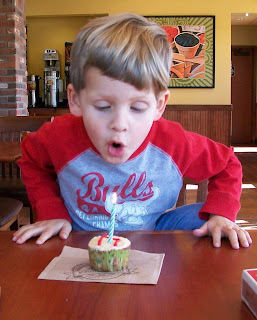 Dawson chose to go to Schlotzsky's for his birthday lunch. 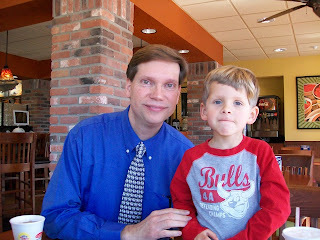 We offered to take him anywhere at all and he insisted on Schlotzsky's. Silly kid. 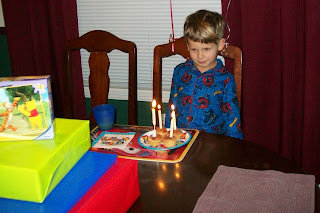 Anyway, he enjoyed his pizza and we even brought birthday cupcakes for him. 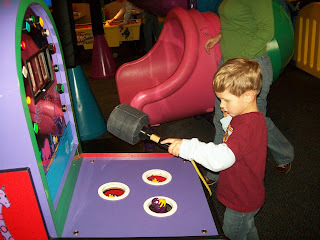 Brady playing with (a.k.a. 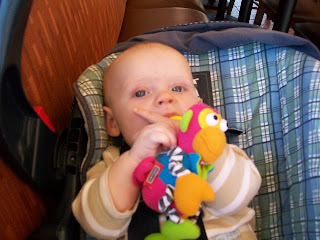 chewing) his little monkey while we were at Scholtzsky's. Laughing and having a good time. Our sweet boy turns 4 years old today!! It's been an amazing 4 years and we are so thankful to be the parents of such a wonderful child. He fills our lives with such joy! We love you, Dawson! 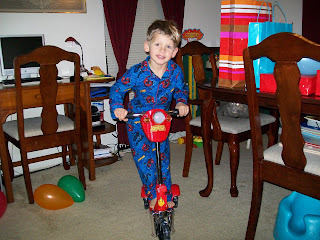 Standing on the new scooter that Nanny sent him. It lights up and makes noise so of course he loves it! Playing with his balloons - always a fun time. 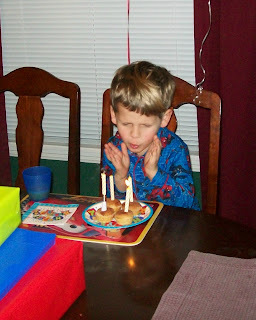 Getting ready to blow out the 4 candles on his birthday muffins. 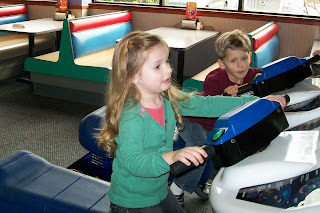 Dawson attended a friends birthday party at Chuck E. Cheese and had a blast! 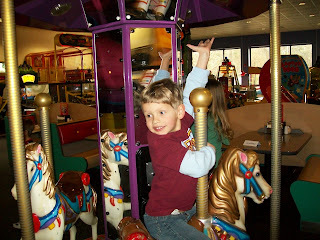 Dawson posing as he rides by on the mini-carousel. 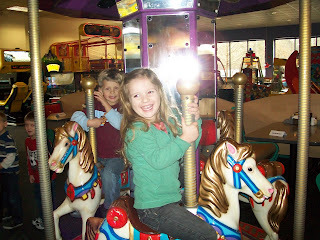 Kaelin and Dawson all smiles as they ride the carousel. 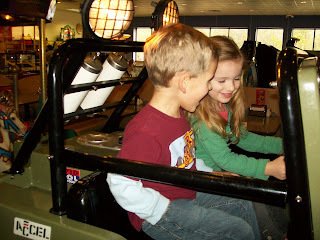 Riding in the big 4-wheeler. Playing on the jet skis. 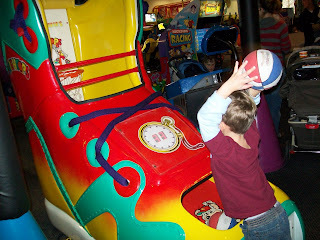 Launching the basketball toward the hoop. 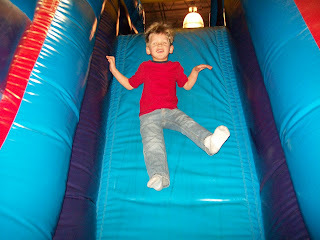 Playing the "ball rolling" game, as he called it. 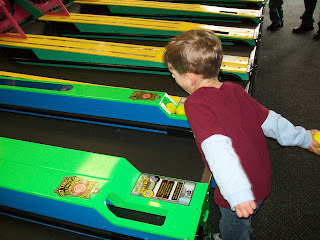 Amazingly, he was able to roll them up the ramp into the holes. 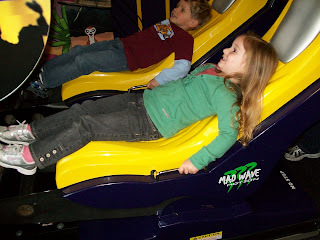 They loved this roller coaster simulator ride! 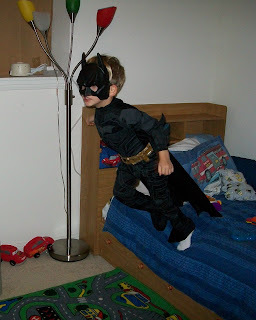 Dawson's Grandma and Grandpa got him a Batman costume for Christmas and it is awesome!!!! It's a little puffy in the chest to make it look like he has muscles, has a neat belt, a long cape, and a very cool mask. 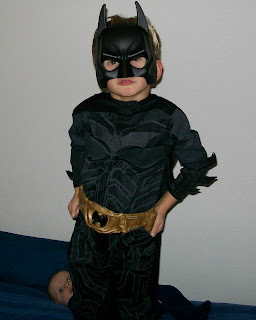 Dawson had a fun time running around and playing in his new Batman costume. 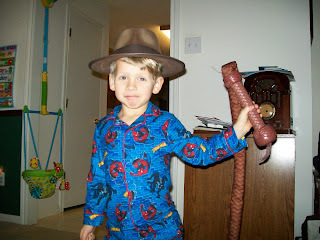 Looking good in his super cool costume. Jumping off the bed - something he did repeatedly. Dawson is very articulate and listening to the way he says things often makes us smile and laugh. When he's really hungry he'll tell us, "I'm famished." 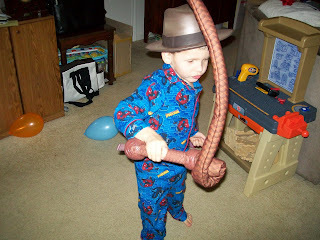 When he chokes on something he explains, "my epiglottis didn't close." If he finds something silly he'll sometimes say, "that's ridiculous." He gets a real thrill from watching Randy play Mario Brothers on his Nintendo DS. He'll give Randy specific instructions: "go straight, jump, look out for that turtle." During suspenseful or scary parts of the game he'll say, "Oh no, I can't watch" and will cover his eyes. He absolutely loves his baby brother. He's very protective of him and when someone else holds him he will tell them, "It's okay for you to hold him, but you can't keep him. He's our baby." And he frequently tells me he'll take care of Brady while I'm busy doing something (like changing clothes or doing laundry) and will get offended if I take Brady with me instead of leaving Brady with him. And when Brady wakes up from a nap, he'll say to him, "Brady, I missed you while you were sleeping." 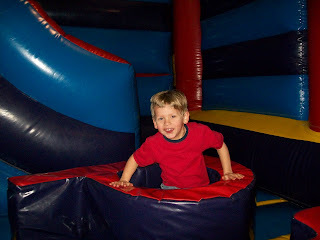 The other night he was sad because he "didn't give Brady a hug goodnight" and he told us so several times that night. He is so sweet. I can't imagine a more kind and caring big brother. 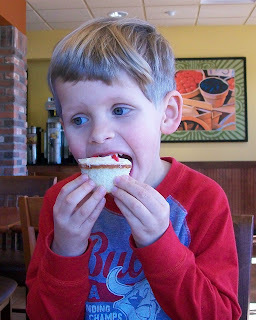 Brady recently sprung a very sharp bottom front tooth. Thankfully he hasn't tried biting me when he's eating. He doesn't yet have the upper arm strength to crawl, but he sure does try. 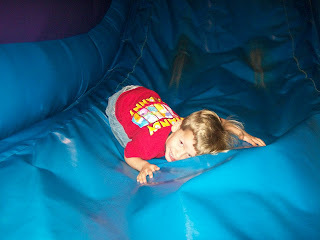 He'll bury his head in the floor, push with his feet, and scoot forward. I'm surprised he hasn't gotten a carpet burn on his face yet. He's still rolling across the room. I don't know why we bother to put him on a blanket anymore because he rolls off of it in no time. 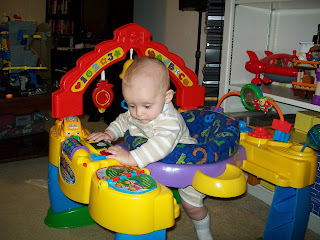 The other day I left him in his room with a few toys to look at / play with and heard him fussing a few minutes later. When I went to check on him he was up against the wall - he had rolled until he couldn't roll anymore. 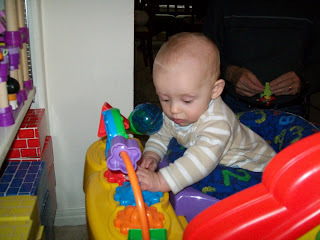 He's become very good at grabbing his toys and shaking them around, although he mostly grabs them and immediately brings them to his mouth so he can gnaw on them. He's trying very hard to sit up. 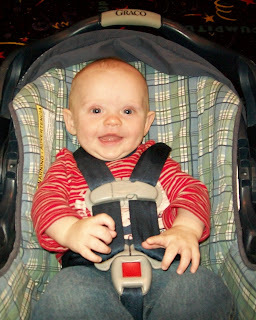 When we put him in his car seat or bouncy chair, he'll strain to sit up like he's doing little crunches. 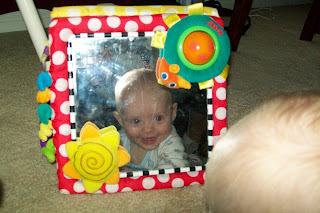 Brady loves to look at himself in the mirror. 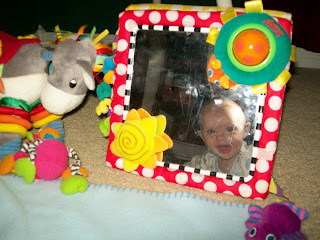 He just smiles and squeals at the cute little baby in the mirror - it's precious!